Designer Jeff Davis has put another spin on recycling by rescuing vintage LPs and creating them into very cool coaster sets. Each coaster is created from an actual vinyl LP records and have the original label intact. The coasters are protected from moisture with a clear mylar seal. 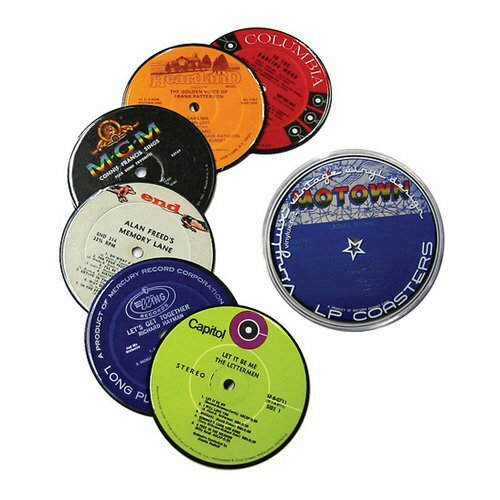 Each set includes a clear case and 6 coasters in a wide variety of music styles with a range of diverse label colors. Diameter of each coaster is 4". Made in the USA. Consumer Warning : The state of California requires warnings for products that contain chemicals known to the state of CA to cause cancer and birth defects or other reproductive harm. This item is upcycled from true vinyl lp records fabricated from many various sources in the 1950's through the 1990's. Due to the vast amount of manufacturing sources, the chemical composition cannot be determined for each record and may contain traces of various chemicals. Consumer Warning: This product contains chemicals known to the State of California to cause cancer and birth defects or other reproductive harm. (Cal Prop 65) This item is upcycled from true vinyl lp records fabricated from many various sources in the 1950's through the 1990's. Due to the vast amount of manufacturing sources, the chemical composition cannot be determined for each record and some may contain traces of various chemicals. If you have any questions about this product by Vinylux, contact us by completing and submitting the form below. If you are looking for a specif part number, please include it with your message.